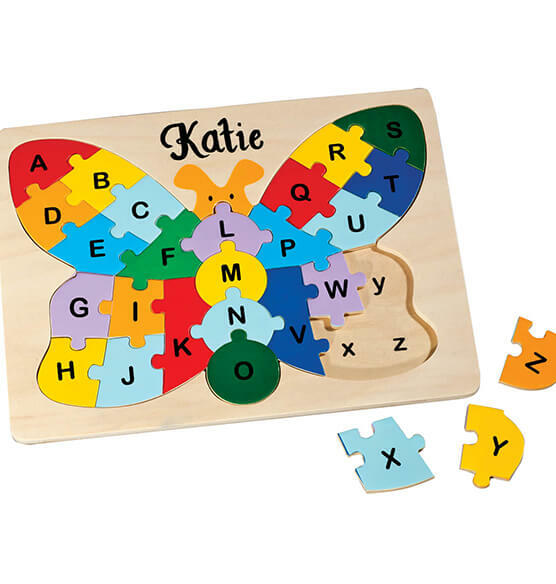 Kids won’t realize they’re learning their ABCs and improving hand-eye coordination ... they’ll just have fun assembling this bright personalized butterfly alphabet puzzle! Providing old-fashioned, educational play your child can enjoy on their own or with a friend (or grandparent! ), our classic personalized wooden puzzle will be beautifully customized, creating a keepsake toy they can pass on to their kids someday. Specify name; limit 1 line, 10 letters/spaces. 11 3/4" long x 8 7/8" wide. SMALL PARTS. Not for < 3 yrs. Bought this for my younger grandchildren.